Each year, around 10 million people visit the Gatlinburg and Pigeon Forge area. Whether vacationing with their children or enjoying time on their own, most are searching for unforgettable memories while visiting the area. 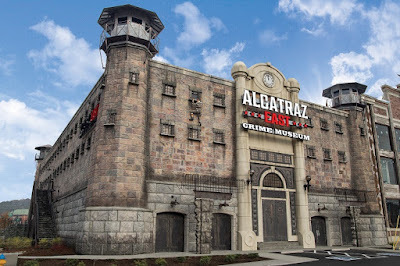 One place that should be at the top of everyone’s list is Alcatraz East Crime Museum, a new attraction on the Parkway that provides both an educational and entertaining time, and includes information and activities for the whole family. 1. America’s Favorite Subject. With all the movies and TV shows related to the topic of crime, this is a must see. The museum features five themes that give visitors a glimpse into notorious crime history, forensic science, law enforcement, our justice system and pop culture. There are over 100 interactives throughout the museum, providing visitors with a hands-on experience. 2. It’s Not About Alcatraz. Although it’s part of the name and the famous prison inspired this attraction, Alcatraz East is a crime museum, featuring an in depth look at American crime history, with artifacts from different eras and topics. The one-of-kind building was designed as a combination of Tennessee’s first state prison from 1898, and guard towers inspired by the Alcatraz lighthouse in California. The two-story building offers over 25,000 square feet of exhibit space. 3, One-of-a-Kind Artifacts. From white-collar crimes to Old West gunslingers, the museum features original artifacts from Jesse James to Whitey Bulger. Things to watch for include the famous O.J. Simpson chase white Bronco, John Dillinger’s death mask, Al Capone’s rosary, a submachine gun from the movie Scarface, Ted Bundy’s VW Beetle. Tennessee is well represented, with objects such as the Old Smoky electric chair and moonshine stills as well as notable Dr. William Bass, highlighting his achievements- which advanced forensic anthropology. 4. Interact with the Museum. Kids (and their parents) can have fun and learn at the same time through the museum’s Top Detective Challenge. Follow clues throughout the museum to solve the crime of a stolen artifact, and receive a prize if you crack the case! There is also an opportunity for parents and kids to enjoy the thrill of The Heist Laser Maze (think Thomas Crown Affair!). 5. Temporary Exhibits. Beginning mid-May, Alcatraz East debuted the first of its temporary exhibit programs, which will be an annual rotation in two areas of the museum. Through April 2018, “Ivory, Tortoise Shell & Fur: The Ugly Truth About Wildlife Trafficking will reveal how endangered species are effected by poaching and what the public can do to help end the practice. Alcatraz East officially opened December 16, 2016. The new crime museum is located at the entrance to The Island, at 2757 Parkway in Pigeon Forge, near the Margaritaville Hotel and Paula Deen’s Family Kitchen. The 25,000 square foot museum is designed with a jail façade, has a star-studded board of experts who make up the Advisory Board, including Jim Willett, a retired prison warden, Anthony Rivera, a combat veteran and Navy SEAL chief, and Judge Belvin Perry, Jr., who is best known for the Casey Anthony trial. General admission tickets are $14.95 for children, $24.95 for adults. Group ticket sales are available. The museum will be open 365 days per year, from 10 am to 9 pm, with the last ticket sold 60 minutes before closing. Please visit the Alcatraz East website to learn more. Alcatraz in the title is misleading since it showcases so much more than that one prison.